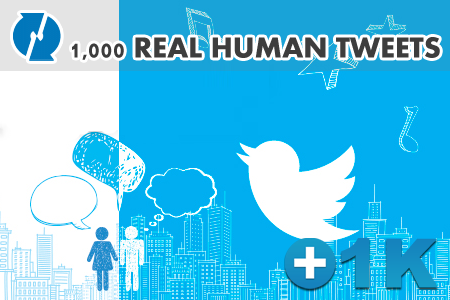 1,000 real human tweets for your message. We provide Real Human tweet for your message, this mean that you will see real twitter accounts tweeting your message. This is the most effective twitter activities that help in increasing popularity, traffic and sales. This also very useful for SEO for the link in your message that all of tweets will be counted as a backlinks. - Tweet message must not be more than 140 characters. - Tweets comes from real human accounts "guaranteed"
- All accounts will have tweets and followers and so on... as they are just real humans. - Delivery rate is about 500 per day.